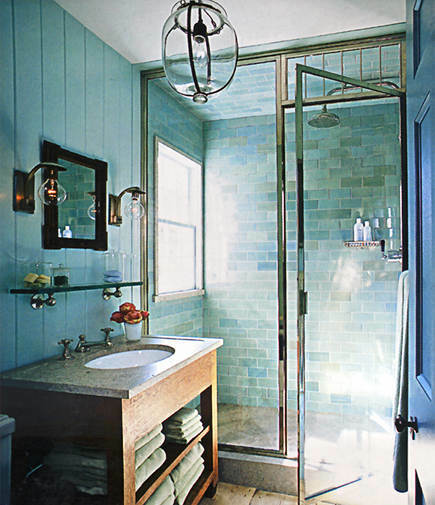 A soft turquoise bathroom color scheme and classic design create a timeless guest spa. According to Benjamin Franklin “guest, like fish, begin to smell after three days.” Too bad Ben didn’t have a turquoise bathroom as nice as this one. In this Long Island guest cottage space, designer Steven Gambrel and partner Chris Connor pamper their lucky invitees with comfortable features like the glass shelf that provides an extra landing zone for toiletries and accessories over the stone-topped washstand. Instant character is added with the unique pendant light fixture and similar ircular vanity globes also are chosen to offset the otherwise linear space. Custom glazed tiles cover the shower walls and ceiling with a large window offering a stunning view of Sag Harbor Cove. Waterworks fittings include the sink faucet and exposed shower set with a rainfall shower head. A Pullman soap dish from Urban Archaeology replaces the now common built-in niche. Avoiding a modern look, the shower glass walls are framed and a transom over the door adds even more vintage charm. The soft turquoise color envelopes the room in the form of painted wood paneling. Their guests may never want to leave. For more of designer Steven Gambrel’s personal spaces see Inviting Entrance Decor and Plum Crazy. It’s lovely to see such a commitment to colour!